June 21, 2018 Dan O. Damn Instagram and their celebrities! 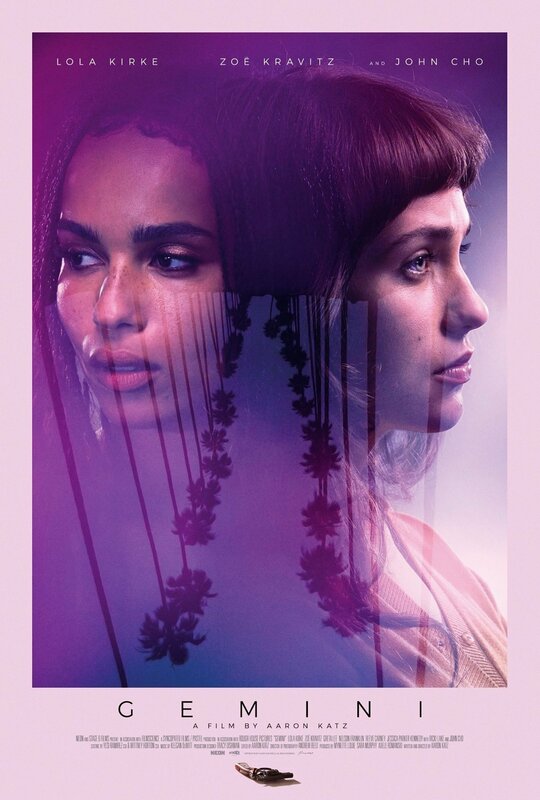 Jill (Lola Kirke) is both a best-friend and a manager to Heather Anderson (Zoe Kravitz), a young and rising movie-star that’s getting all sorts of offers left and right. However, she finds that friendship put to the test when, well, Heather winds-up dead on the floor of her L.A. mansion and without anyone else really fitting the crime for it, except Jill herself. With a detective (John Cho) hot on her tracks, Jill has to find a way to run and hide, and also, find out what really happened to her best-friend, who’s responsible, and how the hell she can clear her name, if at all. Much like he did a few years back with Strange Weather, writer/director Aaron Katz finds a neat, interesting way to spin a murder-mystery noir that doesn’t feel like it’s playing by any rules, but by the same token, isn’t trying to reinvent the wheel that much, either. Gemini is much more stylish and poppier than Strange Weather, however, in that it seems like it’s got a bigger-budget, bigger-stars, and much more room to play around in and with. So why does it feel like the script was only ten pages long? Was it because Katz didn’t have many more ways to spin the modern-noir? Was it because he had enough money and people to do something? Uh oh. Someone just mentioned Lenny. Or, simply, was he just bored? Oddly enough, it feels like much more of the later, with Katz never really allowing for Gemini to get off the ground, save for maybe one or two scenes in the midst of the investigation. Besides these two scenes, there’s a lot of time spent in Gemini, focusing on camera-tricks, long, deep-pauses, and a synth-score that feels like it was taken directly from the 80’s and placed here to give this a Less Than Zero look and feel. The only issue is that Gemini never really revels in the glitz, the glamour, and the sleaze of Hollywood, even if it likes to think it is; it’s mostly concerned with a weak murder-mystery, where the twist is able to be spotted from a mile away, with characters who aren’t even terribly interesting to begin with. And honestly, if you’re mystery at the center isn’t exactly that, a mystery, then you need something compelling to take the place. Lola Kirke, try as she might, is saddled with Jill, a rather boring character who isn’t necessarily ambiguous, as must as she’s just sort of there, moving from scene-to-scene, place-to-place, person-to-person, sort of keeping the same emotion and tone, and not really doing much else. I get that she’s supposed to be our conduit into this whole underground world and story, so to speak, but a small sliver of personality would have helped us not only identify with her, but interested in the kind of person she could be. Meet the new Lola; same as the old Lola. But nope. Katz has too much fun here with the slow-zooms to really think of stuff like character-development. But really, not all of Gemini is bad. At the center, there’s something of point to be made about this awful, sick, twisted and demented world of Hollywood, especially now what with social-media literally everywhere you turn, but even that gets fogged-up by a half-baked murder-mystery. By not trying too much at all, Katz was able to bring out real tension and shock with Strange Weather and what eventually came of that plot as it unraveled right before our very eyes – Gemini feels like he may be trying too hard and never needed to. Or maybe it didn’t try hard enough. I’m still not sure. Consensus: Even with a solid cast, Gemini doesn’t feel as if it ever fully gets off the ground, with a not-so intriguing murder-mystery, pretentious style, and a willingness to hip and edgy, yet, not getting close to either.